While you can manage your corporate files from within Baan and ERP Ln sessions, you can also send these files when you deliver your ERP documents to your business partners. As an example, when you e-mail your purchase orders using Baan Mail-Merge, it will produce individual personalized e-mail messages for each order, and can possibly include selected attachments for all items in every order that are defined using Baan Hot Link. 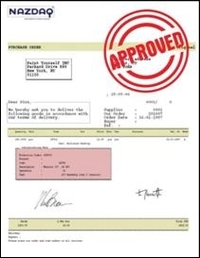 If you need multiple signatures before e-mailing your purchase orders, this is also integrated in the same process with the Purchase Order Approval Extension. Strategic Alliance is driven by the complementing strengths of the two organizations. ITWARE with strong local presence in Middle East with years of experience in working with Baan / ERP LN customers in the region which brings strong local flavour to the relationship, while MERINO with its one of the largest Baan / ERP LN teams, strong delivery strengths, proven On Site/ Off Site/ Off Shore Delivery Model and Global experience makes this alliance as compelling option for existing and new customers for Baan and ERP LN. User and administrators can now create a "back-end" Planning Dashboard instance that centralizes the ERP system data. Many "front end" Planning Dashboard instances can be spawned to refer to this single "back end" version. And only one data refresh to the "back end" is required. The data in the "back end" Planning Dashboard instance can be refreshed in an unattended mode. Using standard Windows functionality, "appropriately quiet" times can be chosen to refresh the ERP data. In addition to the new function to spawn "front end" Planning Dashboard instances, the calibration routines have been fortified. Problems where the routines failed to properly calibrate have been corrected. Some Baan systems have customizations or localizations that cause the calibration or data load to fail. Please contact us if this occurs at your site. It will be our pleasure to correct the problem or adapt the Planning Dashboard tool to your specific environment. Merino Consulting Services Inc (MCS), a US subsidiary of an India-based Infor Channel Partner, today announced it has signed up as an Infor Channel Partner in North America. Merino started its US Entity in year 2009, as a part of a global expansion initiative. The initial focus of MCS will be in the South East Region of the US, including Florida, Georgia, North Carolina, South Carolina, Alabama, and Tennessee. Over a period of time MCS plans to expand its geographic coverage across North America. Merino shall be concentrating its core strengths on Infor ERP LN and focus of sales initiatives will be on ERP LN and complementary Infor solutions. Merino has strong experience in delivering end-to-end implementations as well as managing and supporting existing implementations on ERP LN across various industry verticals like Automotive, Industrial Equipment & Machinery, Hi Tech Electronics, Projects, Textiles, etc. Werken aan de volgende release van het standaard Baan product? Dus deel uit maken van het core Baan-Development team? Wij zoeken ervaren- en beginnende Software Engineers en Quality Assurance Engineers. Ometa has build a Solution that turns every BaaN query and Baan session without coding into a Webservice. It has also an own .NET SDK for programmers to communicate directly with BAAN-sessions and queries. Ometa has also built a solution that makes EVERY BaaN application available in SharePoint. You can read/Write/update/delete to every Baan application directly from Microsoft SharePoint. Baan queries can be mapped to SharePoint lists to share information within your organization. Ovet chooses the Ometa Integrator solution to build Portals in SharePoint integrated with the ERP system. As a drive to be a true global partner of Infor, Merino Consulting Services Inc. (Merino), one of the leading Partners of Infor, today announced its first success in the Middle East. METITO (Overseas) Limited a UAE based water and waste water solutions provider selects Merino as a Patner-2- Progress to migrate from Baan IV c4 to Infor ERP LN. METITO selected Merino after thorough evaluation of more than six Infor ERP LN implementation partners/ companies. Merino’s domain expertise, Infor ERP LN technical and Functional Skills, robust and proven Migration Methodology along with Historic Data Migration methodologies and professional approach during the evaluation cycle were key factors for METITO to choose Merino over other competitors.